National Grammar Day? Really? Who'd have thought that existed? Seems my homophones post from just a few days ago was premature, but what else is new? Anyway, I came across some funny grammar-related stuff today. I've also decided that the Official Grammar Style Guides are a little too strict for me, so I have chosen to pick which rules are musts, which rules can be axed, and which rules can be bent to my advantage. You know, my own style guide! I just did a quickie search on BFF Google and found out that previously mentioned Martha Brockenbrough, the Grammar Prude and my hero, founded this day just a few years ago. I guess I gotta pay attention to my heroes more. She even received a commendation letter from President Bush! After she wrote one of those articles I told her it was awesome. She replied, "I hoist a beer in your direction!" I realize some of the links on those other posts I sent you to are going to zero-content pages. Let's just say I'm working on it and I'll try to get on that in my spare time! Jeez. Ungrateful. You will know if you are grammar-tastic if you appreciate these resources that I found today. If not, skip to the beer review and bite me. 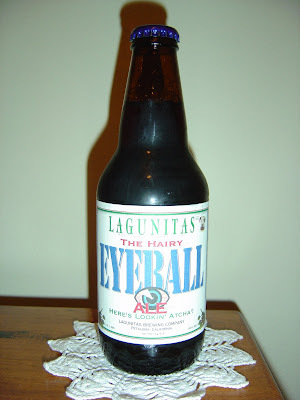 Exhibit A and Exhibit B.
Tonight I'm drinking The Hairy Eyeball Ale brewed by Lagunitas Brewing Company in Petaluma, California. The label has a small bloodshot eyeball with some hairs growing out of it. Strange! And below the eyeball it says, "HERE'S LOOKIN' ATCHA'". Malty, roasted caramel aroma with some dark fruits and booze in the background. The flavors are a little different, with a big dose of chocolate and brown sugar right in the beginning. A little spicy, too. Dark fruits, raisins and rum-soaked cherries give a big hello in the middle. Syrupy, molasses-like texture and pretty sweet all the way through, and that sweetness is a little annoying. Carbonation is on the low end. The 8.83% alcohol is noticeable but works. A good beer! I really like being wrapped in labels that include hairy eyeball, fruit booze, chocolate spicy rum, raisin syrup and alcohol. Hic! Hey Martha. It's a sign of complete adoration! Dos Beer-igos. Way to spell Grammar correctly! LOL.